WASHINGTON, D.C. — The Centers for Medicare and Medicaid Services (CMS) has amended the proposed 2020 Medicare Advantage (MA) payment rate for Puerto Rico in its Final Call Letter and MA Ratebook. However, the impact of the finalized CMS policies will be a minimal increase in rates of approximately 3.3% from 2019 to 2020. Since the Health Insurance Provider Fee will be reinstated in 2020, the actual increase in revenue is expected to be only 1%. This increase is far less than that of annual health care costs, which are projected to be around 6%. 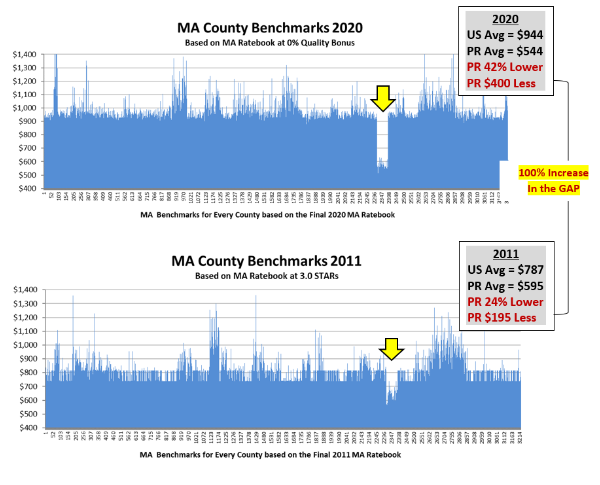 MMAPA President Jim O'Drobinak reacted to the funding changes, saying "While we are grateful to CMS leadership for continuing the application of critical adjustments for Puerto Rico, these improvements do not meaningfully change the systemic underfunding of MA on the island, particularly in light of the continuing impact of Hurricane Maria. The resulting scenario underscores the need for Congress to pass legislation that will permanently eliminate the federal funding disparities that are undermining the health care system in Puerto Rico." The Final Call Letter increases MA base rates by 6.2% for Puerto Rico, which is mainly impacted by the increase in the national average of 5.6%. Unfortunately, the base rates in Puerto Rico are so low that the resulting dollar increase is much less than the national average growth. 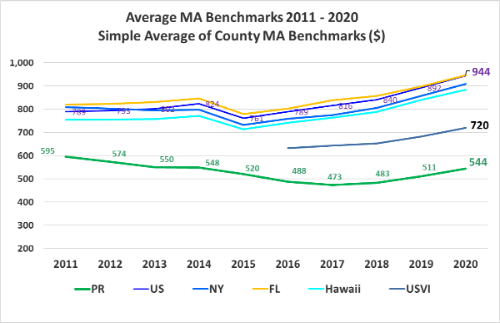 The simple average of MA rates per county is now $544 monthly for Puerto Rico, compared to $944 nationwide. The dollar difference between the Puerto Rico MA rates and the national average is now around $400 per month, doubling the pre-Affordable Care Act disparity in 2011, which was about $200. O’Drobinak added: "The rate change is a step in the right direction, but it is ultimately insufficient to address the long-term shortfall of federal MA payments to Puerto Rico, which has dropped to 42% below the national average in 2019 from 24% below in 2011." "While we are encouraged by the work of the administration in making technical adjustments for Puerto Rico, the perpetual disparity continues to be the biggest challenge in the efforts to avoid physician migration, improve provider compensation, and reduce the ever-growing gaps in infrastructure and administrative operation of the health system in Puerto Rico," concluded O’Drobinak. MMAPA will continue to work with Congress and the administration to address these funding inequities and ensure that the U.S. citizens of Puerto Rico receive fair funding for their health care system. Prior to the announcement by CMS, members of Congress on both sides of the aisle and the governor of Puerto Rico had urged CMS to address the inequities.